I still suffer from impostor syndrome--I think most creative types do. Thus, it's extra gratifying and reassuring when I get approached to design for someone (vs the other way around.) I was thrilled to bits when Fairmount Fibers, the US distributor of Manos del Uruguay yarns, asked me to be the featured designer for their Spring 2016 pattern collection. I've worked with them before and they are lovely people to do business with--and the yarn's pretty darn nice too! Lisa said, "Our focus continues to be on items for women that are accessible in both senses: to wear and to knit." I really love and appreciate that sentiment because that's what I strive for as both a knitter and a designer. While I do design on those intense, gotta-have-that-thing urges, I dislike pieces that are boring to knit even when they do produce stunning results. I am both a process and a product designer, of varying degrees depending on the individual design. I get bored knitting and grading the same construction or styles of garments, which is probably why my portfolio is so...diverse? Fragmented? I strove to channel those urges into a collection that explored various textures and construction methods while unifying everything under a central color palette. I didn't have a set mood in my head at the time, but upon viewing my proposal Lisa described them as 'streamlined and elegant,' which I think dovetails nicely with the aesthetic of Manos yarns. When working for a yarn company, my designs should still 'look like me' (since they obviously like my work), but my goal is also to showcase the yarns to their full range and not force them to be something they aren't. 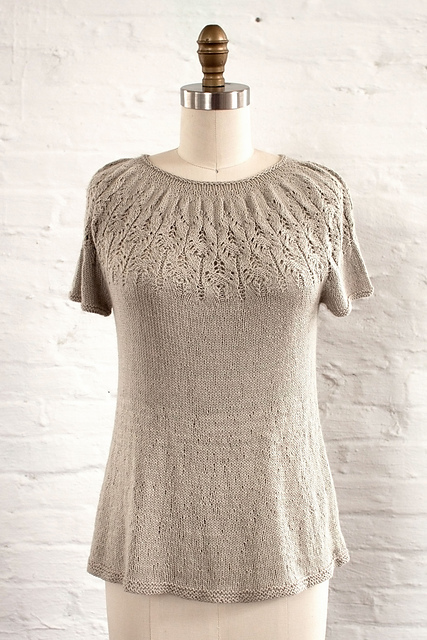 Coronilla is a top-down tee worked in Serena, which I've worked with before and just adore. The floaty, A-line shape of the body makes this shirt versatile for being dressed up or down. Interestingly enough, the lace yoke pattern is a bit of a happy accident, a rearranging of the traditional Oriel lace pattern. I'm not at the point in my talent (or confidence) that I can create an original lace pattern from scratch! Jazmin is a striped two-color cowl, also worked in Serena. Are stripes passé? I don't mind if they are! I think stripes will always be appealing even if they aren't outrageously popular--there's something so responsive about the neat geometric lines and it's such a fun, easy way to play with multiple colors. Here, graduated stripes of varying thicknesses help transition between the two colors. Serena comes in multicolors too, and I think a multi + solid combination would be great here. I love knitting cowls as a tube in the round with the ends grafted together. Partially because it's enjoyable to knit (no wrong side rows!) and partially because the execution is so crisp and clean. Pitanga is a long, open front vest worked in Silk Blend. I wanted a sleek layering piece with muted texture. Cables are traditionally flanked by purl stitches so they 'pop', but here I played with laying them on stockinette fabric so the cables gently carve in and out of the surface. I could see this over a pretty printed sleeveless blouse or a dress with a waist detail you want to show off. Oh, and the back of the neck? I DIE. Yasss! So clean! This piece is worked in one piece from the bottom up with the cabled section incorporated into the body. Once the shoulder area shaping starts, the cabled bands are set aside and worked separately before being seamed onto the back of the neck. I love this detail! It's kind of a hybrid between a shawl, a wrap and a scarf, so I think you could style it as a combo of all three! I was really inspired by some of the more unusual shawl shapes I've been seeing from designers like Hunter Hammersen and Courtney Spainhower. And you know, fringe. The fringe is created from dropped stitches at the end so that's right--no attaching a million pieces of fringe after the fact with a crochet hook! It's my favorite piece from the collection and I can't wait to have one of my very own. I had already designed the Gilt Sweater at this point in time and clearly was still feeling the laceweight held doubled, colorshift ombre thing. Unlike Gilt, which uses two similar colors to create a seamless transition, Eucalipto has a marled effect in the transition zone due to using two totally different shades. Same technique, different results! It's knit sideways in one piece from front edge to front edge, with the sleeves added after using the short row sleeve cap method for top down sleeves. The drape of Lace is perfect for those waterfall fronts and adds some nice elegance to the piece. Huge thanks to Fairmount Fibers for trusting me to design the core of their Spring 2016 collection and a million infinity thanks to my amazing sample knitters Joni, Alison and Chaitanya. None of this would have been possible without you, because I would have died from exhaustion trying to knit it all myself!